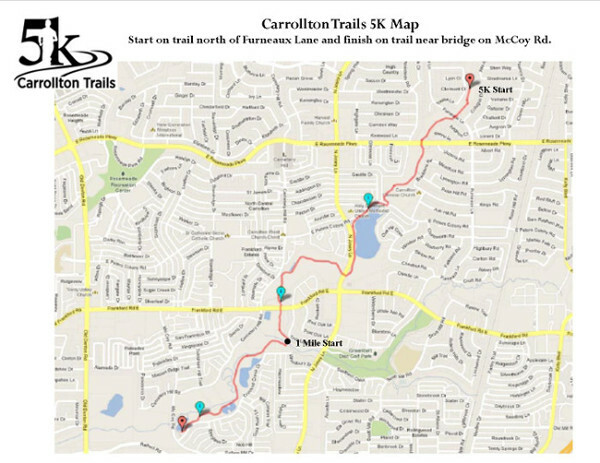 Enjoy this race as you run through one of Carrollton's best assets, the hike and bike trails. Did we say fast? You may be able to set a personal best. This course is concrete trails and downhill. Awards will be given for overall male and female runners, and medals will be awarded to the top three finishers in each age category of the 5K competitive run (10 & under, 11-14, 15-19, 20-29, 30-39, 40-49, 50-59, 60-69, 70 & over). Prizes will also be awarded to the top three registered dogs. Refreshments will be provided at the end of the race for all participants. Pre-registration by April 22 guarantees a race bag, T-shirt and timing chip. Any changes made after April 22 will incur a $5 change fee. *Maximum of six (6) people from the same household in the same race. Awards will be given for overall male and female runners, and medals will be awarded to the top three finishers in each age category of the 5K competitive run (10 & under, 11-14, 15-19, 20-29, 30-39, 40-49, 50-59, 60-69, 70 & over). Prizes will also be awarded to the top three registered dogs. When this page loaded, the official time was 4:16:54 AM EDT.